The literature on the New African Diaspora is growing. One of the latest is the volume co-edited by Isidore Okpewho and Nkiru Nzegwu, published by Indiana University Press in 2009. A common thread in the literature is the identification of the "brain drain" as a major consequence of the establishment of the New African Diaspora. Another common postulation is that the "brain drain" can be turned into "brain gain" through the concerted efforts of African governments, international organizations, and members of the diaspora themselves. This paper interrogates popular and intellectual assumptions about diaspora, brain drain, and brain gain. The paper is divided into four parts. 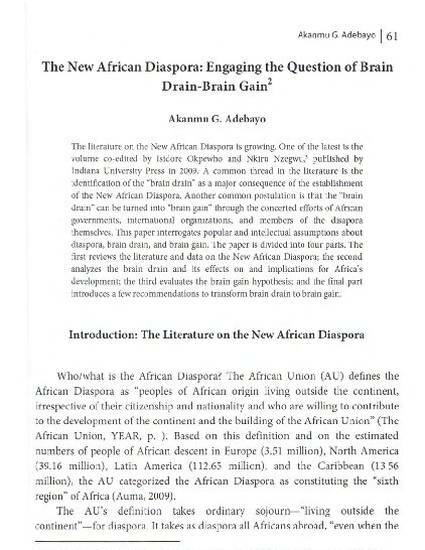 The first reviews the literature and data on the New African Diaspora; the second analyzes the brain drain and its effects on and implications for Africa's development; the third evaluates the brain gain hypothesis; and the final part introduces a few recommendations to transform brain drain to brain gain.